I have researched yarn shops in Corfu before, and found a couple of blogs that suggested the place to find yarn in Corfu is a lingerie shop. And I have tried to locate one in Corfu Town once a few years ago – to no avail. However, this time I was determined to find it. All I knew was that it was ‘around the corner from M&S’. Yes, there is an M&S in Corfu Town! 2 large balls of aran weight wool/acrylic mix from Italy in very short variegations of blue (suitable best for crochet I think) and a 4 ply angora/acrylic mix from Turkey in longer variegations. The purchasing process was interesting. I had to take the yarn to the haberdashery counter for the yarn to be bagged and the prices to be written on a small piece of paper, then take the paper to the front of the shop to pay. I bounced out very happy. 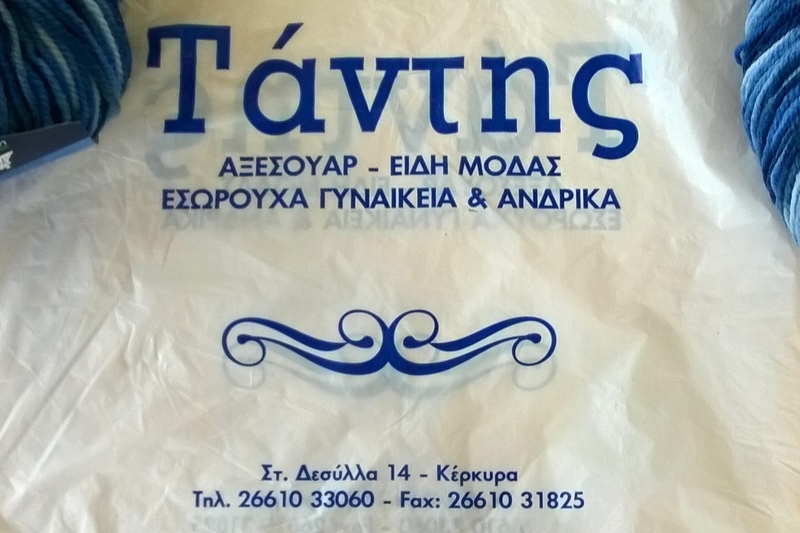 And it is located at 14, Stamatiou Desila, very close to the open air market (recommended for a visit to see the most glorious display of fresh fish for sale). We hired a car for a few days and took our usual route through town to get from the port to the seafront at Garitsa Bay, a route we have travelled many times which goes through the open air market and, yes, right alongside the lingerie/yarn shop – over the years I must have passed this shop so many times yet not realised it was a yarn shop! On foot it is easy to find, it is just around the corner from M&S, walk south on Theotoki Georgiou with M&S on your right and take the very first right turn – the shop is a very short distance along on the left. 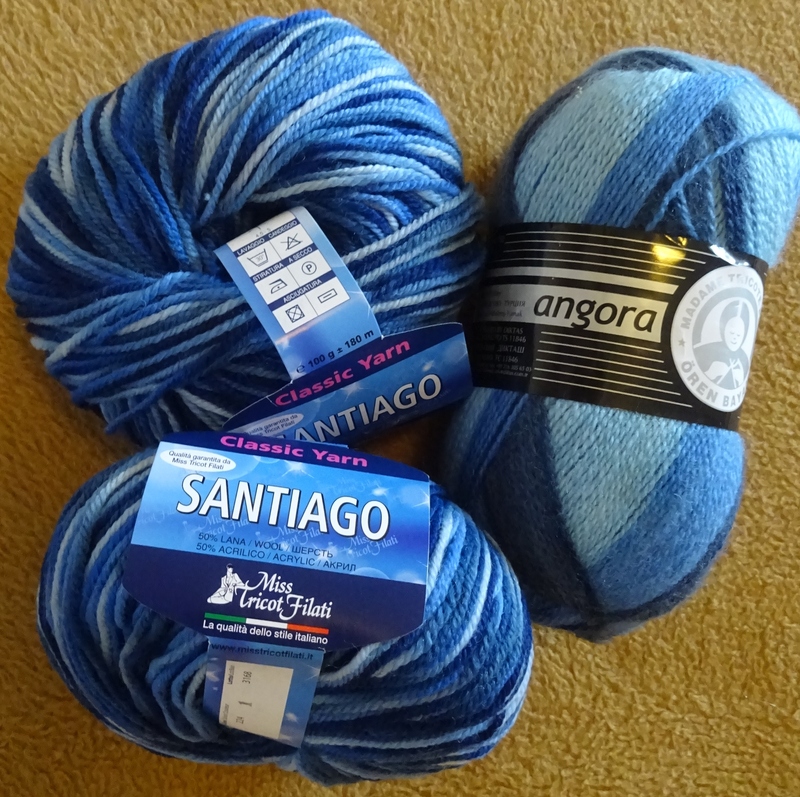 I have no idea what I will make with this yarn, but I chose blues because, as well as being one of my favourite colours, it reminds me of the blues of the skies and sea around Corfu. I was very satisfied – I had found yarn in Corfu fairly early in the holiday (but was it the only one?!). So my next adventure was to revisit a lovely crochet and lace shop in Kassiopi – more about that tomorrow.